Freshman pitcher Kira Doan just before releasing a pitch in Tuesday's close loss to Lynnwood. 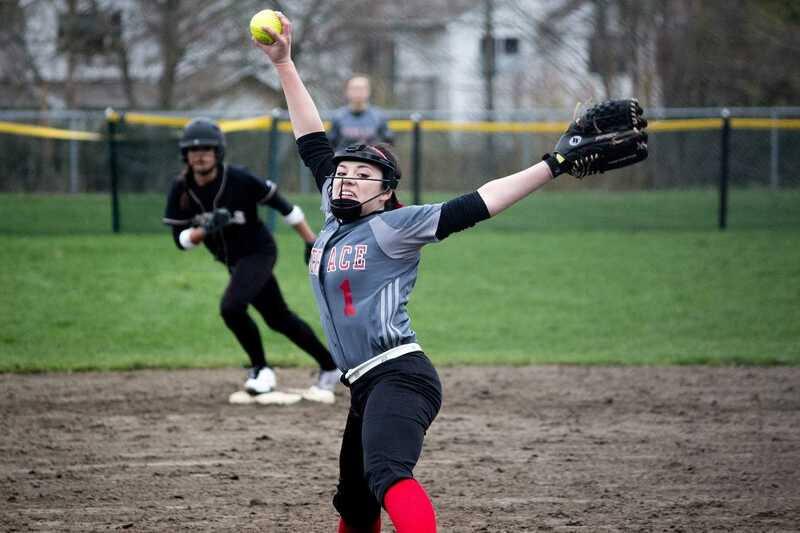 Freshman pitcher Kira Doan just before releasing a pitch in Tuesday’s close loss to Lynnwood. After crushing Granite Falls 8-0 on Monday, the Hawks lost to the Lynnwood Royals, 7-5 Tuesday at MTHS. Going into the bottom of the 2nd inning, Lynnwood had a 3-0 lead on the Hawks when Terrace junior Hannah Wilcox scored to shorten the Royals’ lead on the Hawks. After another Royals’ score in the 3rd, Hawks sophomore Ashley Fitzgerald hit a pop fly to right center, scoring another run to make it 4-2. The Hawks would score twice more including the tying run by senior Maddy Kristjanson to knot things up at 4-4. The Royals came back in the 4th with a ground rule double and then a home run to make it 7-4, top of 4th. The Hawks would fight back and score in the bottom of the 7th making it 7-5, only to lose on a controversial double-play. Partway through the first week of the season, the Hawks are 1-1. Terrace will take on Marysville-Pilchuck, Thursday at MTHS at 4 p.m.